Dinner is included in the reservation price. We accept US dollars or Pesos. Please note that all our private rooms have a double bed, not two single beds. Wi-Fi is free and available just at common areas (We want to invite everybody to socialize in common areas and relax at dorms). A deposit of $50 USD will be charged at the time of check-in for all reservations in Private rooms. In the case of any damages/theft of the room, the deposit will be retained. If the damage/theft is greater than the amount of the deposit, the guest will be required to pay the total amount of the repair/replacement. This deposit is 100% refundable in the case there is no damage/theft of the room. Welcome to Nomads Hostel & Bar (Formerly Mayan Monkey Cancún) a new standard in an astonishing building which features a rooftop pool with a huge Bar, a cosy hangout area were you can enjoy the sunset surrounded by people from all over the world and all amenities a backpacker could wish for! Ask for our BBQ pool parties! We also include Free Dinner! 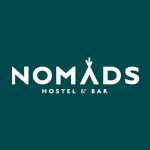 Nomads Hostel & Bar is located in the heart of Cancún downtown, within 3 minutes walking distance from the main bus stop, where you can take a ride to many cities among México. Also, we have the best local transport links 2 blocks away, where you can find 24 hour buses running, which connect you to the Hotel Zone, where all our white sandy beaches and Cancún famous nightlife are located. We look forward to having you stay with us! Welcome to Nomads Experience!